Bywa means waterspout. Bywa Udthaik is a version of this story that is told on the artist’s island of Badu. 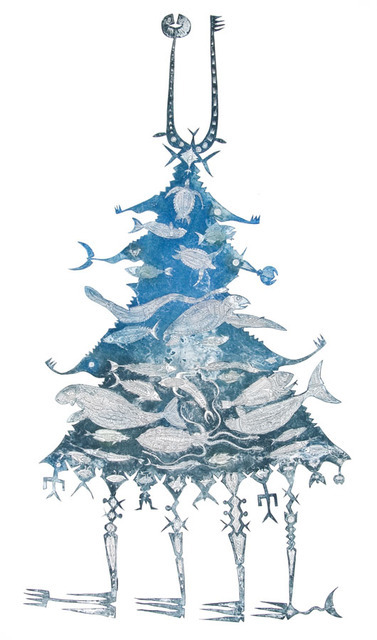 The spirits that create and inhabit the waterspout are drawing up and feeding on the dugong, turtle, fish, squid, sea snakes and other sea creatures depicted in the print. The name in for this in Kala Lagaw Ya, the Western Torres Strait language, is Udthaik. Bywas are not a common occurrence and the artist states that when they are witnessed their awesome nature makes is easy to understand the spiritual significance his people associate with this phenomena. The pyramid shape is representational of the water spout and at the base there are feet like elements which indicate that it is moving across the ocean and is being guided by the eye like shapes at the very top of the image. A dance that celebrates this rare occurrence witnessed in nature, Bywa Au Sagul, is performed on Badu Island.